Display benefits where your members congregate! 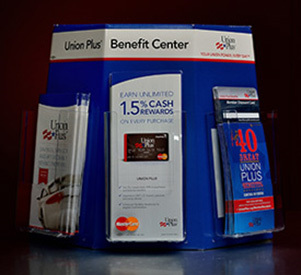 About every three months, Union Plus will automatically send you a new supply of the credit card applications and brochures, coupons, and flyers highlighting the many other valuable and cost-saving Union Plus benefits. The three-pocket brochure display is easy to set up and use. Simply place it on a table in a high-traffic area where union members will see it - e.g. a work-site, cafeteria or training center. Then drop in the brochures that come with the display. Click here to order your FREE brochure display or call 1-800-472-2005. Your members will thank you for the information! We did a big campaign this summer to explain some of the [Union Plus] benefits in simple graphics and it was very successful.